First of all, don’t worry about having to familiarize yourself with a totally new UI. We’ve kept the same fundamental UI that you know (and hopefully love) and made some relatively small but notable enhancements. For example, we tweaked the icons and added a really cool new theme called “The Black Theme”. It’s great if you want to reduce eyestrain, or if you’re working alone at night and want to feel like you’re in some kind of super ultra-top-secret underground Command Center. Searching in RDM is now easier than ever! Now, your search will scan your active vault, along with all of the other vaults that you have access to. And if your search is successful, RDM will tell you which vault contains what you’re looking for. If you use RDM for MacOS, you can now choose the dark theme, which will change your UI to a really sleek black and gray background. 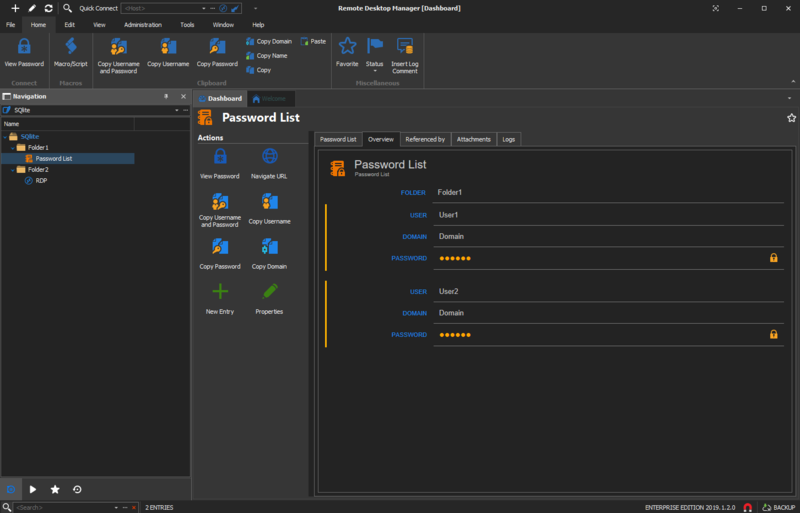 These are just some of the improvements that you’ll find in Remote Desktop Manager 2019.1. Please share your feedback by commenting below. We’re always listening, and your input will help shape v2019.2, which is already in development (we don’t slow down here! ).